Okay, I've officially given up on catching up to my 4PAM posts, so I'm going to venture forward, and hope I can make up for the missing posts as I go along. So, without any more self-flagellation, I thought it was about time I posted my COPPRclay firing guide. 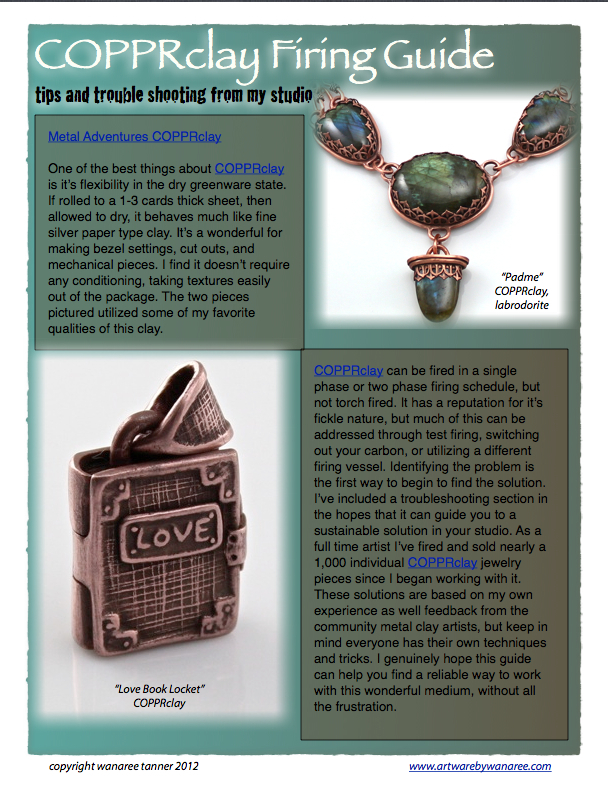 A lot of my copper pieces are made using Metal Adventure COPPRclay, it's flexible and forgiving in it's greenware state, and has a nice long shelf life in an opened package. Of course, since it's a base metal, it comes with a whole slew of potential problems when firing. After several years of working with and firing this medium I'm finally ready to release my firing guide... and no, there's not one golden formula that is going to work for everyone in all situations, it's guide to finding what will work for you and your kiln. Although one golden formula would be much nicer! They say we trade off the ease of firing silver for the low cost of base metals, but it comes with conditions. We really must test fire our kilns, I say we, because I have been repeatedly guilty of throwing complex, new work into a new firing situation only to have major failures. So, save yourself the grief I got to know all too well, and test fire some blanks or simple designs first. And just to make things even more confusing, what works for one type/brand of base metal clay won't necessarily hold true for another. My firing schedule and technique is totally different for Art Clay Copper. I promise I'm not trying scare you off of base metal! I have consistently great results with different types of firing situations and brands of kilns, which is what gave birth to this firing guide. It is totally possible, and really rewarding once you've got it all figured out! So here it is, my COPPRclay firing guide, click on the first page below, it'll take you to where the full PDF is posted and available for download. There are hyperlinks embedded into the PDF to where the items highlighted are available. Much luck to you, and feel free to write me if you have any follow up questions!